First Line: I was sitting outside the Commodore's mansion, waiting for my brother Charlie to come out with news of the job. The year is 1851. The California Gold Rush is at a fever pitch, and the Commodore has his little corner of the universe in Oregon City, Oregon nailed down tight-- due in part to the efforts of his two hired guns, brothers Eli and Charlie Sisters. The Commodore sent another of his employees down to San Francisco to keep an eye on someone who severely displeased him. Now it is up to Eli and Charlie to go down there and kill the man. They pack a few provisions, saddle up their horses, and set out... only nothing on this trip seems to go smoothly. Every time Charlie gets near a saloon, he has to get drunk, and they're losing time because of his hangovers. Eli has nothing but trouble with his horse, and every single person they meet along the way seems to be more than a bit strange. This picaresque novel is a pure delight. 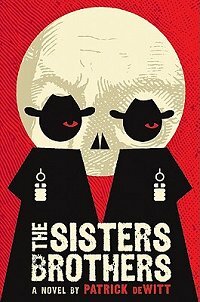 The tale is told by younger brother Eli, and as the pages turn, it's easy to begin to wonder how on earth he could be one of the infamous Sisters Brothers-- killers that most people cross the street to avoid. Eli is so honest and forthcoming about himself and what happens along the way that when I did find out that he, indeed, did come by his reputation honestly, I was in a bit of a shock. It is easy to fall into a line of work and be good at it whether you like it or not, but Eli's had enough. He wants to turn over a new leaf, take the money he's saved up, set up shop, and become a storekeeper. Even though his brother Charlie thinks that idea is hilarious, I was rooting for Eli every step of the way. DeWitt makes every paragraph of his tale look as easy as falling off the proverbial log. Every character comes to vivid life (even Eli's horse) and the action flows as smooth as can be. By book's end I honestly felt as though I'd experienced life during the Gold Rush in all its grimy, scary, funny, thought-provoking glory. My only complaint is that I finished the book far too quickly, and I'm left feeling like Oliver Twist. Please, sir-- may I have some more? Cathy - Interesting-sounding book! I really do enjoy historical fiction, so I my just give this one a try. Okay, I'm going to go ahead and admit how shallow I am. I've been attracted to this book because of its clever cover, so I'm glad to see you gave it an A+!! When you rate a book this high, I know I'll like it. I've been noticing covers more lately and this one is a gem. This sounds like a great book. I’ve awarded you a Stylish Blogger Award. Congrats! Found you through Robyn at You Think Too Much - looks like you are reading a lot of interesting books! - following! Very interesting! Yet another of your reads that I must find a copy of. Thanks for a great review. Margot-- I hope you do. I loved it! Kathy-- You're not shallow. I normally don't pay much attention to covers, and I love this one! Robyn-- Thanks! I'm so busy with visitors and the like that it's going to take me a while to get to it! Dorte-- Lift it! Lift it!